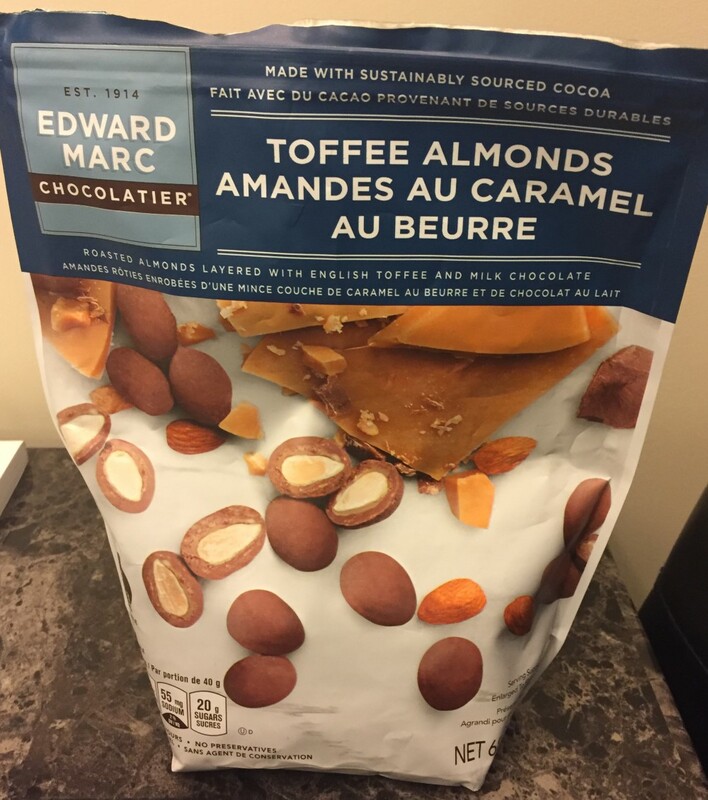 Review for Edward Marc Milk Chocolate Toffee Covered Almonds. If you love chocolate covered anything, check these milk chocolate toffee covered almonds out while they are available! Hi, I’m Natalie from costcuisine.com! I am a huge Costco fan, so I decided to start a website dedicated to Costco food. 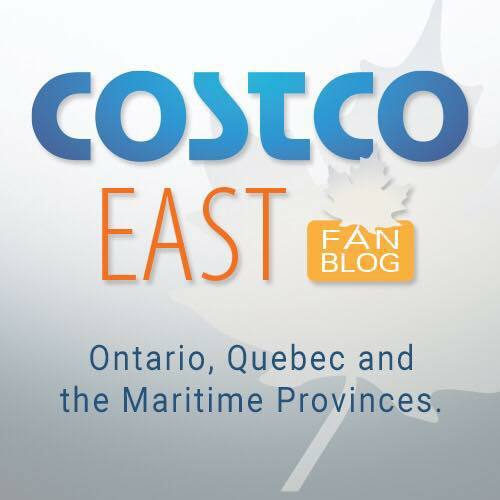 Costco West generously lets me post a guest review here, but if you want to read more reviews or see some Costco recipe ideas, please check out my website or follow me on social media! I randomly picked up this bag of Edward Marc Chocolate Toffee Covered Almonds from Costco because they are new and they look pretty darn tasty. I was not prepared for how good these turned out to be. I have to get another bag ASAP because my husband basically ate the bag over one weekend. These are the kind of chocolates where you keep saying “okay one more”, then proceed to eat 10 and repeat “okay one more”. Edward Marc Chocolatier is a family-owned business and they use sustainably-sourced cocoa. I reached out to the company on Instagram to ensure these were available in all of Western Canada. I confirmed they are and no, I was not offered a free bag (I wish!). 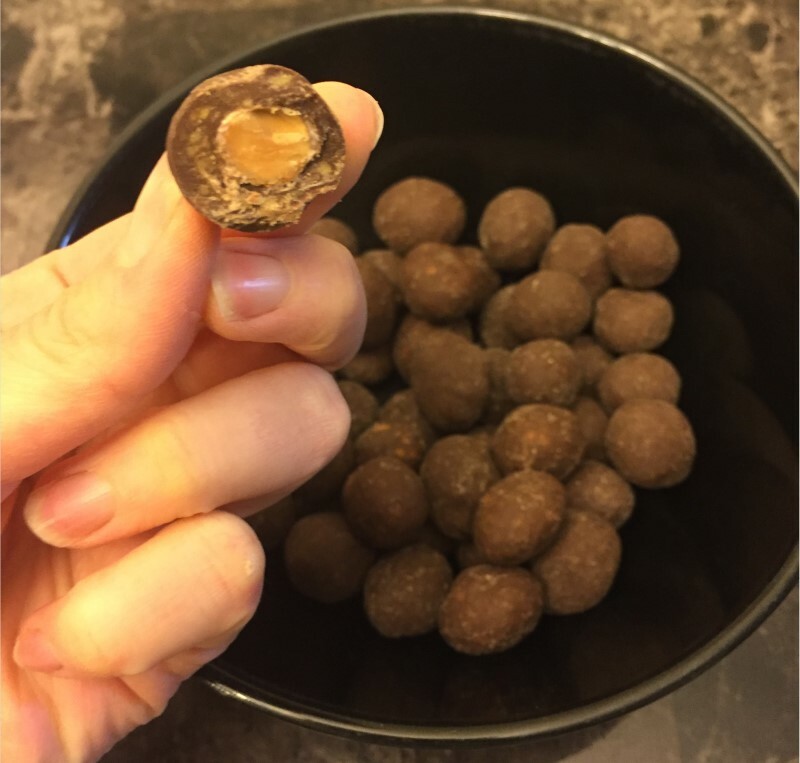 Anyway, I knew I needed to review them immediately because you know Costco, here one day gone the next, and chocolate lovers won’t want to miss out on these! These are not a health food, but they will definitely induce some good feelings when you eat them because they’re super delicious. They’re high in both sugar and fat. Eight of these contains 210 calories, 13 grams of fat and 20 grams of sugar. 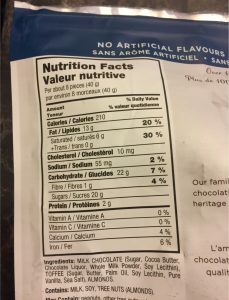 The high fat is due to the fact there’s a pretty good-sized roasted almond surrounded by delicious milk chocolate and toffee. Bonus points for the fact that they do not have any artificial flavors or preservatives. These taste so very good, I can’t even tell you. I find them quite different than other chocolate-covered almonds. The chocolate on the outside is not the super shiny, smooth chocolate; it appears to be more of a thick cocoa finish. This somehow makes them taste more decadent, like they are truffles from a specialty chocolate shop. Under the rich milk chocolate there is a substantially-sized roasted almond coated in toffee. When I first bought these, I pictured them maybe having a chewy toffee center but they are more like a crunchy roasted almond that has been candied with toffee. They’re not overly sweet and are super satisfying, especially if you like chocolate covered nuts. 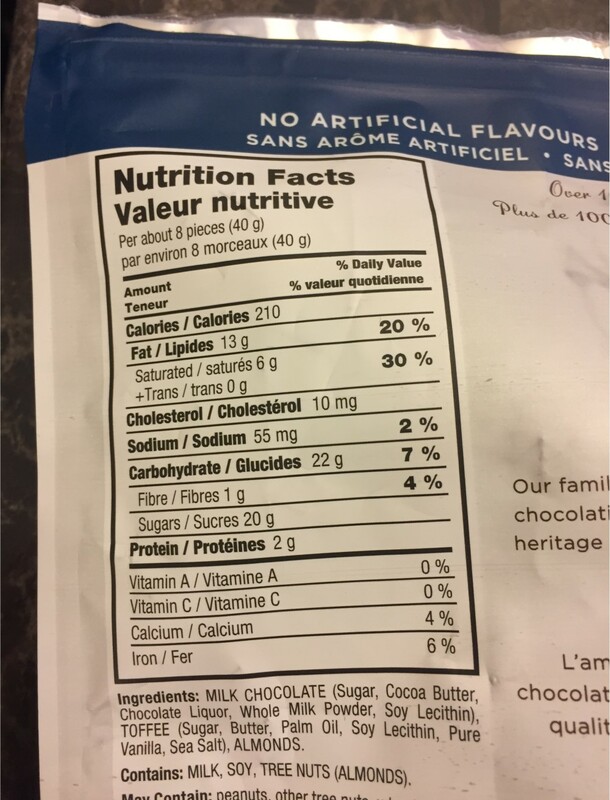 I purchased these for $13.79 Canadian which I don’t think is bad at all for a 680 gram bag of chocolate-covered almonds that taste like they came straight from a high-end chocolate shop. I feel completely fine spending $14 on these when I think about how many times I’ve bought those small boxes of chocolate-covered almonds (usually for a fundraiser) for $5 to $10 each with chocolates that are not near the same quality as these and don’t taste nearly as good. They come in a re-sealable bag with an expiry date of about a year after purchase. We live in a really warm apartment and I decided to keep them in the fridge to maintain freshness and prevent them from melting; I have to say I think they taste even better right from the fridge, cold. Try it and let me know. Basically these are as convenient as a product comes. Overall, I would purchase these again in a heartbeat. I know if I brought a bag to work they’d be gone by 10am. I hope Costco carries these around the Christmas season because they’d be great to put out for company or just to enjoy while watching Christmas movies. I could also see baking fancy cookies with these! Are you an almond fan? What’s your favorite thing to eat that is covered in chocolate? For for more reviews check out my blog Costcuisine! I’ll be sure to buy a bag (or 2) on my next Costco trip. Thanks for the review. Sounds delish. I will meed to try these! Yum!! Which Costco did you find these at and just with the other nuts, chocolates and fruit snacks in the front of the store? I froze these to take on a trip! They are even better eaten right out of the freezer! Yumm…can’t wait to pick up a bag next time I’m in Costco! Thanks for the review Natalie . How does this compare to the US only Hershey’s Symphony bar with toffee and almonds? That bar is awesome! I would recommend you buy them. If they’re not to your liking, just return them for a full refund.